Many cities throughout the US have 311 telephone systems and New York City is no exception. This special number is intended to divert inquiries from the 911 number, which is reserved for emergencies only. "311's mission is to provide the public with quick, easy access to all New York City government services and information while maintaining the highest possible level of customer service. We help agencies improve service delivery by allowing them to focus on their core missions and manage their workload efficiently." 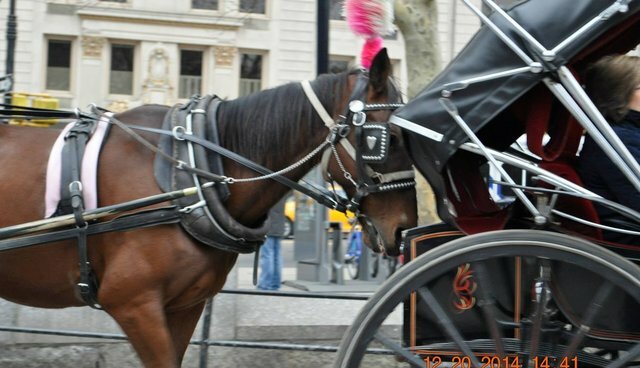 However, when it comes to registering complaints with authorities about the carriage horse business, it is a bust. A recent list obtained through the Freedom of Information Law for complaints registered with 311 since 2006 revealed some interesting but mostly useless information. Many of the complaints were taken by phone and entered into the system by the operator. Many were categorized as "Overcharge." Many also were about rude behavior. Complaints referred to as "Time Insufficient" were more interesting. But most complaints did not include basic identification – such as the license plate number of the carriage. This is the information FOILed. It is extensive and unwieldy. It is no way to deal with this important issue. Most of the callers were told that they would be mailed a form from the Department of Consumer Affairs. This was entered into the data base a few months after the complaint was registered. I wonder how many of them followed through. Complaint: "Caller states a horse drawn carriage driver hit the caller's vehicle several times with a horse whip. Plate 1129." Response: 11/27/06 "Unfortunately, the behavior that you complained about does not violate any law or rule. As a result, no city agency has the jurisdiction to act on the matter." 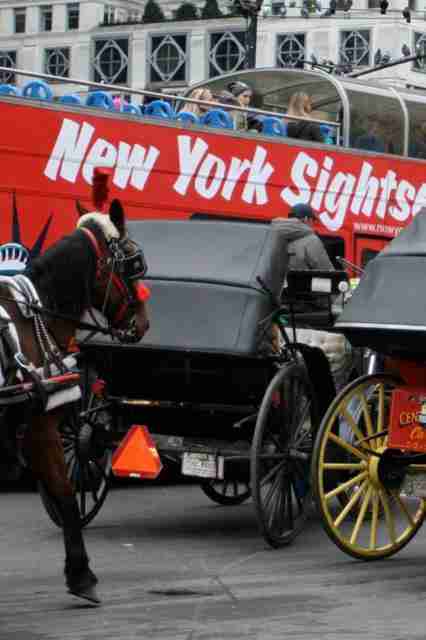 10/27/07: "Customer is stating that horse carriage driver hit her and fled the scene. She wants to report the incident. The caller was injured and taken to the hospital and wants to file a complaint. She was hit from behind and run over. The wheels went over her ankles. He fled the scene when she did not get up. The ambulance was called and the police took a report." 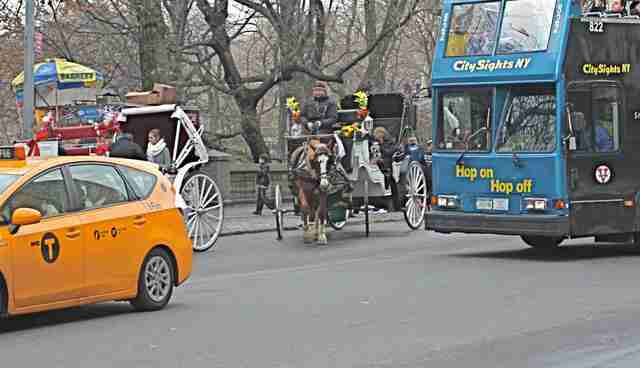 4/25/14: "There was a horse-drawn cab in which the horse was spooked by a bus and fell tipping over the carriage. The horse was pinned underneath the carriage. The horse was injured as a result, but was made to return to work, limping on his legs." 11/25/07 - "The caller is an attorney and wants to find out information about a specific rickshaw operator. Caller wants to file a complain for the fact that the caller's child fell out and got run over by one of the carriages." 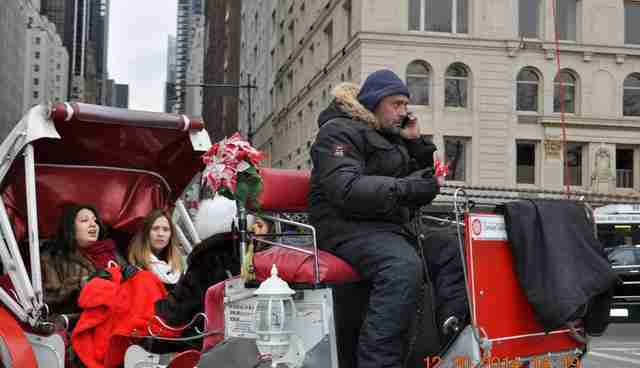 2/2/13 - "Caller had an accident with a horse drawn carriages in Rockefeller Center, Manhattan. This took place on Saturday, December 12, 2012. Caller is riding in the carriage with his son and a woman. They were on 6th Avenue headed toward 52nd St. A metal piece fell off the carriage. The driver stopped the carriage by pulling off to the side. The driver got out of the cab. 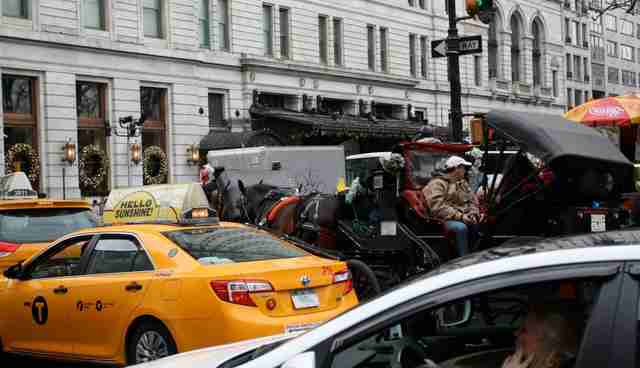 The horse took off with the carriage and ran down the street on 6th Avenue. They went about 65 yards. The horse tried to get between two cars that were waiting for the light. The carriage hit the back of the cars. The carriage went up in the air and crashed down. The caller's son went flying out of the carriage and sustained minor injuries. The caller and the woman were injured." Intro 573 is the bill introduced into the City Council in December 2014, which would ban horse-drawn carriages from operating in NYC. It is in the Transportation Committee. Because an industry would be shut down, the law requires that an Environmental Impact Study be completed and until it is, no vote maybe taken on this bill. But even after it is hopefully passed, the drivers will be able to operate until mid 2016 when their licenses expire. If they take this to court, they will be on the streets for a much longer period. In the meantime, how do we deal with this wild, wild west laissez faire attitude displayed by this industry? The ASPCA gave up humane law enforcement in January 2014, transferring it to the NYPD. But they are not taking it seriously and for the most part street laws are not enforced. The law does not require drivers to report accidents to anyone - not the NYPD, not the Department of Health or Consumer Affairs. The press knows about very few. We have often relied on reports from random eye witnesses. But most are simply not reported. And 311 is not the venue to make a difference. Similar to no one knowing how much this cash only business pays in local taxes; no one knows the truth about the number of accidents that actually occur. When someone encounters overcharging, bad service or hostile behavior, they may be upset at that moment, but then they want to forget about it and do not make a formal complaint. When there is a two month lapse between the complaint and hearing back from 311, most of them are probably dropped. It is the rare person who takes the time to make a complaint in the first place. This kind of reporting should be made available to the public so they can make an informed decision about whether they want to take a ride. The 311 reports are only available if you make a Freedom of Information request to the Department of Information Technology and Telecommunications and even then, it takes many months to be fulfilled. This could be done without having to pass a law and the information could be presented in a much better easy to understand format. We need transparency in government. Time of incident; location; 4-digit license plate from the rear of the cab. If you are able to get closer, get the 4-digit hoof number from the left front hoof of the horse - otherwise provide a visual description. For good measure, describe the driver. Take pictures - they can be invaluable - but not without the other information. And always contact us at coalition@banhdc.org. Don't forget to contact your Council Member to ask that he or she support a ban. And for good measure, and if you do not live in NYC, call these members of the Transportation Committee: James Vacca (718-931-1721); Deborah Rose (718-556-7370); David G. Greenfield (718-853-2704); Antonio Reynoso (718-963-3141); Daniel Garodnick (212-818-0580).